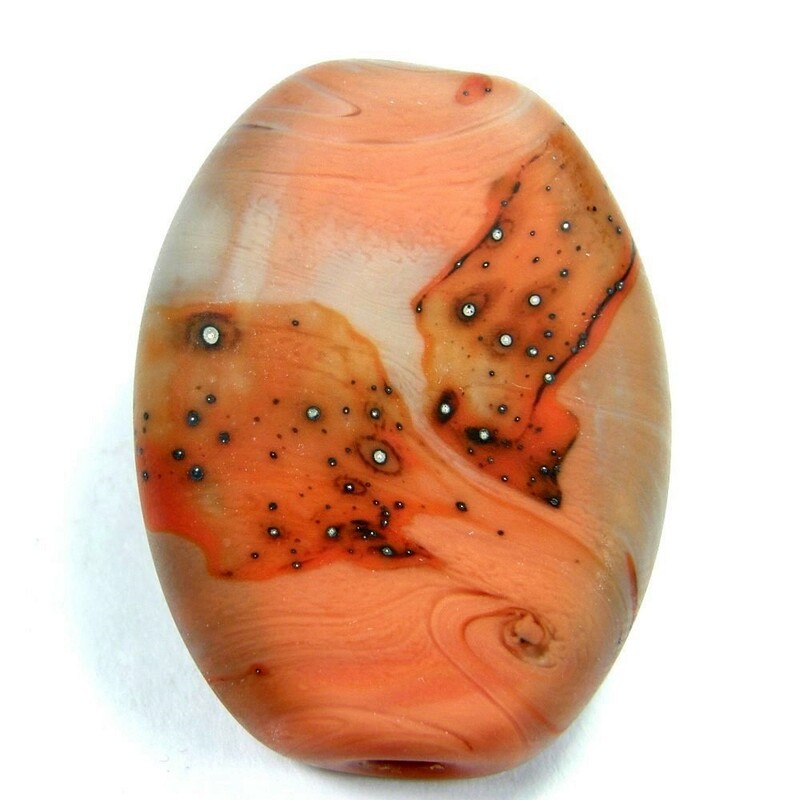 This beautiful large hole bead will get you from the Christmas holiday season on into Spring, Summer and Fall! My artisan glass charms fit name brand jewelry including Pandora, Trollbeads, Biagi, Chamilia, Capri, Caspia, add a bead jewelry, snake bracelets, omega necklaces and other trendy European charm bracelets. Each bead has been slipped onto my personal Pandora bracelet for fitting. My lampwork glass charm beads have about a 4.6 to 5mm hole so they will fit most chains, nylon, silk, ribbon, rubber and leather cords. Add them to a black leather necklace for a quick and easy way to expand your jewelry collection for instant new accessories and styles. Price is for bead only. Bracelets, sterling silver charms and other glass charms beads not included. Other photos are for visual examples only. 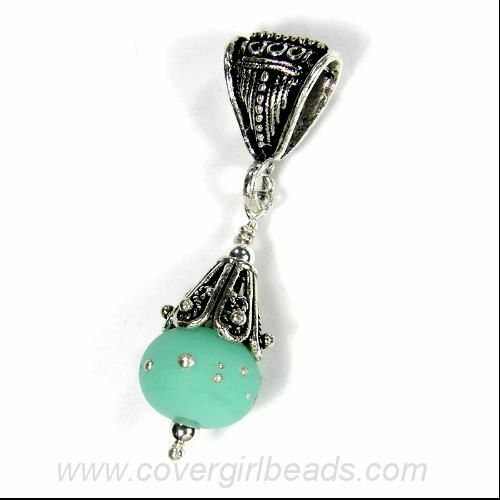 Some of these beautiful beads can be found in my Large Hole Beads section in myCovergirlbeads Artfire Store. Petroleum green, lime green, apricot, ivory and black make up this unique organic handmade lampwork glass focal bead. This beautiful handmade bead began as an ivory bead with an intricate crazing pattern created by the ivory glass. I added some layers of petroleum green and lime green trailing around it with a final layer of apricot for a splash of color. The petroleum has a wonderful webbing pattern next to it due to a reaction between the glass. This organic bead has a lot of character and would look great made into a pendant strung on a leather necklace. It would also look fabulous as a fan pull dangling beneath your favorite ceiling fan. This is a bead with a lot of potential to become anything you want. 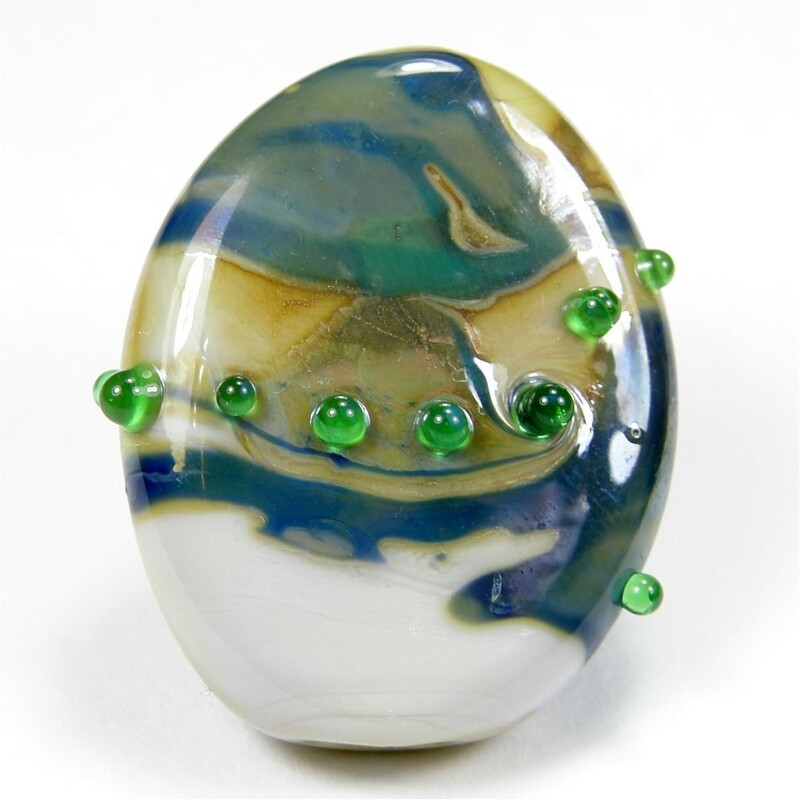 This petroleum, lime, apricot and ivory lampwork glass bead is handmade by me, Covergirlbeads glass artisan, Charlotte Hayes. My handmade beads are made one at a time in my studio along the Texas gulf coast. 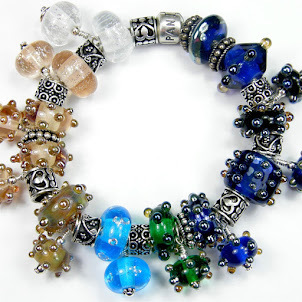 These beautiful beads can be found in my Focal Beads section in my Covergirlbeads Artfire Store. This is a beautiful handmade lampwork bead made using a transparent medium amethyst glass. I added a ripple effect around this oblong focal bead. 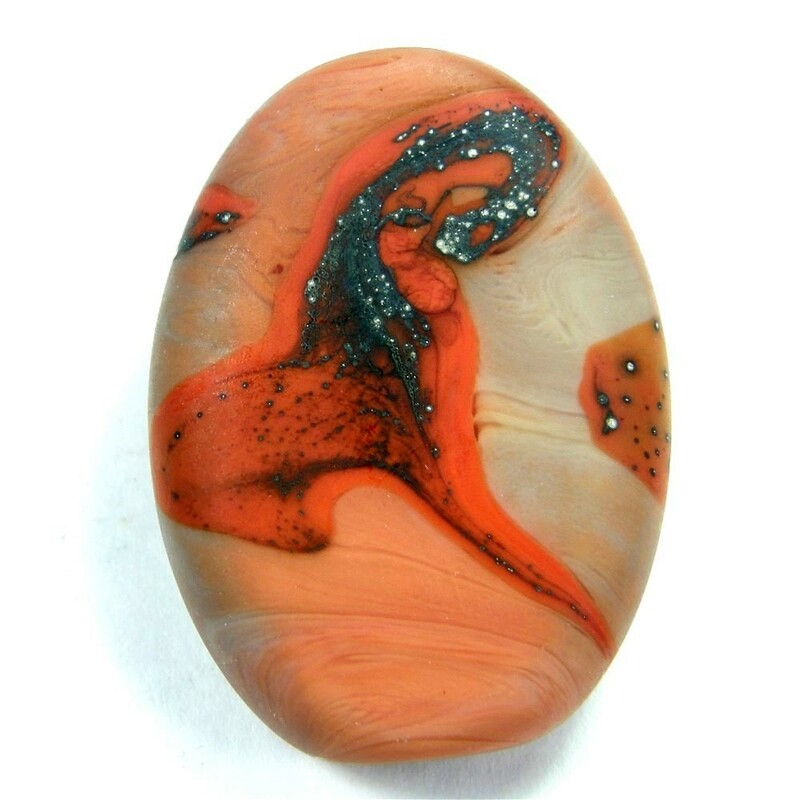 This beautiful focal bead has been sold be others can be found in my Focal Beads section in my Covergirlbeads Artfire Store. 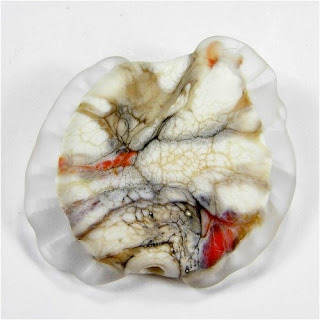 This is a large handmade lampwork glass focal bead. I have it in my Artfire shop. It is made the the deliciously beautiful and delicate "true" pink called rose quartz. I made it with thousands of tiny trapped air bubbles and squeezed it into a lentil shaped bead. This beautiful handmade lampwork focal bead is unique. It has a base of light pearl gray with slate blue peacock colors and gold hues scattered around this handmade lampwork glass bead. It also has some raised dots and a beautiful oil slick metallic shine. This focal bead has been sold but you can see more beautiful handmade focal beads inmy Focal Beads section in my Covergirlbeads Artfire Store. I call this my Ancient Artifact Cave Dwelling Picture. 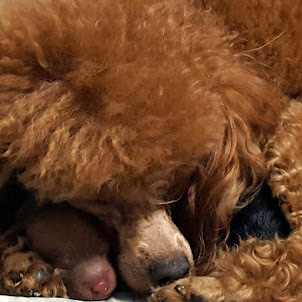 This is the only one like it. By the time I finished playing with the corals and pinky beige color and swirling the colors around, an interesting pattern evolved. It reminds me of an ancient horse drawing in a cave (to me anyways). The neck and head of the horse have a dark charcoal color with tiny silver specks. I have kept it for a while just to enjoy it myself for a short period of time before offering it to a new home. This focal has been sold but others can be found in my Focal Beads section in my Covergirlbeads Artfire Store. This beautiful handmade lampwork bead is an elegant oblong bead made using transparent pale blue gray and has been wrapped with fine silver. 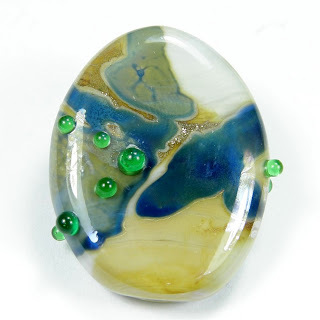 Just imagine this gorgeous glass bead made into a pendant on an elegant sterling silver necklace or a beautiful center focal bead for a bracelet. Bright and springy grass green with raku frit handmade lampwork glass beads. Wow! Vibrant grass green opaque glass beads that have been rolled in raku frit and pressed into lentil shaped beads. The range of colors of the raku frit is gorgeous! These beautiful beads can be found in my Designer Lampwork Beads Section in my Covergirlbeads Artfire Store. Gorgeous rustic organic handmadce lampwork bead with wings. This focal beads has been sold but you can see more beautiful handmade focal beads inmy Focal Beads section in my Covergirlbeads Artfire Store. Artfire rolled out their fresh new look for their studios - I love it! This rustic organic style handmade lampwork focal bead has been sold. It was made using encased copper mesh and Double Helix Terranova glass. my Focal Beads section in my Covergirlbeads Artfire Store. 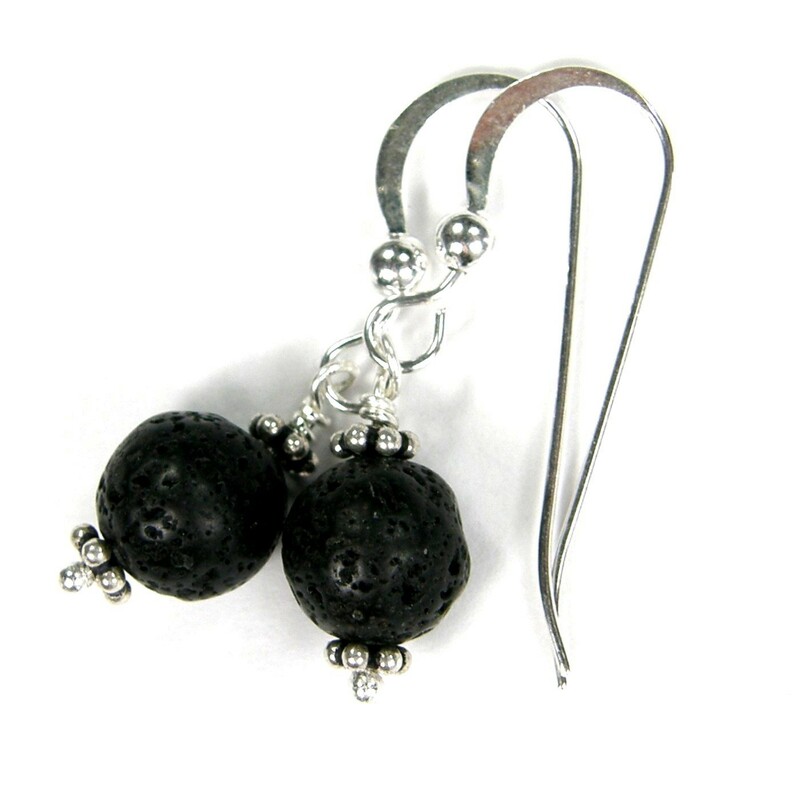 Beautiful black lava gemstone rounds made using .925 sterling silver findings, balls and earwires. 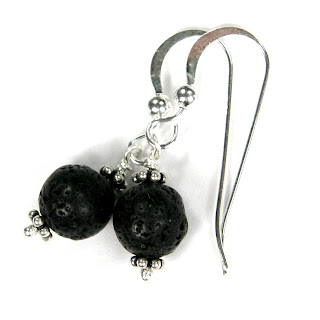 They're simple, elegant and can be worn for a variety of occasions. These beautiful earrings have been sold but you can see more of them in my Earrings section in my Covergirlbeads Artfire Store. This is a beautiful handmade lampwork glass bead pendant I put in my Artfire Shop. I used the incredible kryptonite color with fine silver dribbled around it. I added lots of sterling silver and came up with this gorgeous pendant! You can view the pendant page for the picture listed.